A ten year veteran trooper with the Arizona Department of Public Safety (ADPS) has been hospitalized following a collision early Thursday morning on westbound Interstate 10 at 43rd avenue. A Toyota Tacoma, traveling on SR 169, crossed over the centerline into the oncoming lane of traffic and a Ford van head on. The driver of the Tacoma died at the scene. The driver of van was airlifted to a hospital in the Phoenix area for treatment. Updated on January 25, 2016, at 11:52 a.m. by Quentin Mehr, Public Information Officer. 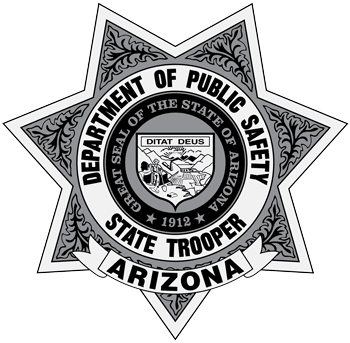 Phoenix — Troopers statewide will once again educate drivers about the importance of seat belt usage with the help of a $40,000 grant from the Governor’s Office of Highway Safety (GOHS). Phoenix -The Arizona-Mexico border provides the perfect storm in relation to drug trafficking, human smuggling and other illicit activity. No border state has as much on the line as Arizona. California has a wall and New Mexico has mountain ranges. Updated by Raul Garcia, Public Information Officer, on December 24, 2015, at 4:30 p.m.
Phoenix — A suspect in a road-rage shooting incident that occurred early Halloween morning along Interstate 17 was arrested earlier today by troopers with the Arizona Department of Public Safety (ADPS). Arizona Department of Public Safety (ADPS) detectives have arrested 36-year-old Christopher Hoffman for the road rage shooting he committed along SR 101 near Bell Road, on Saturday morning, October 3.